Samsung SDI has developed an electric vehicle battery said to offer a range of 360 miles and recharge to 80% in 20 minutes, and expects to begin mass production by 2021. Samsung SDI aims to have its new battery technology in mass production by 2021. 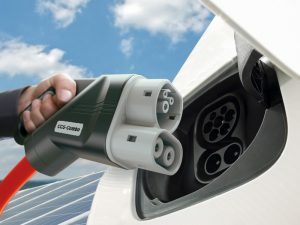 Presenting at the Detroit Motor Show, the South Korean company, which has produced batteries for BMW and Volkswagen Group plug-ins, said the new units were aimed at broadening the appeal of electric vehicles and accelerating the market. The technology uses a new ‘integrated battery module’ – the building blocks of a battery pack – which can accommodate twice as many cells. Today’s modules typically hold 12 cells with a capacity of between 2-3kWh – Samsung SDI said the new units will double the capacity, and thus the range, of future batteries while reducing the weight and number of components required.